Like baseball managers and football coaches, business executives want their team, their employees, to be “on the same page” – to understand how their roles play into the workings, and the success, of the larger organization. In many ways, that’s the promise of digital transformation. It’s about processes, not people, but the goal is the same: to get every aspect of the organization moving in the same direction. This will create efficiencies and synergies that make it possible for the people, employees, managers, and executives, to get the most value from their assets. The challenge is a good deal more complicated. The assets and the process workflows that tie them together are complex and largely incompatible. Shop-floor machines have been collected over the past 20 years. Networks are constantly in need of upgrades. ERP systems have grown in number and variety. Databases and data warehouses exist in different business units. What should be simple review and approval workflows now take 15 or 30 steps to complete? As for clouds – well, they’re showing up everywhere. It’s clear that digital transformation will be a work in progress for years to come. It should also be clear that progress wouldn’t be possible without a baseline that begins with real-time visibility into the organization’s core workings, its operations. Business data is often held in “silos,” applications and databases that belong to groups such as manufacturing and production to logistics, purchasing and customer service. These groups typically get the information they ask for, but there’s no simple mechanism for aggregating the combined data upward to operations managers or executives. Real-time operations visibility does exactly that by delivering holistic views of how operations impact each other. This lets managers get answers to questions – “How did Thursday’s production stoppage affect customer deliveries?” for instance – in time to influence outcomes. By comparing new events to baselines, managers can see patterns emerging before they become problematic. Several machines from a certain vendor might be nearing end-of-life, for example, or a new software upgrade might be causing seemingly random problems in several different groups. Real-time visibility can help turn conventional reactions into reactive responses. Changes in production and logistics demands could signal a positive shift in customer attitudes toward a set of product features. Real-time visibility can help you gain a competitive advantage by alerting marketing and sales. 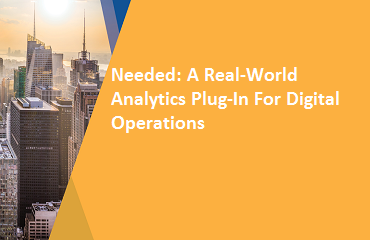 Perhaps most important, real-time visibility sets you on the path to realizing the benefits of higher-level analytics functions. These range from anomaly detection and change management to incident-lifecycle management and dynamic failure prediction, and they grow best on a foundation of real-time visibility. “If it were easy, everybody would be doing it,” goes the saying. The same holds true for bringing real-time visibility to operations, and for digital transformation in general. The new digital infrastructure will have to deal with massive increases in data and signal types. Mobile phones, commercial sensors, GPS and other IoT devices will create changing complex arrays of signals, as will the machine sensors and event logs of process software throughout the business and its ecosystem. Newer technologies will bring newer challenges, and change will be the new constant. Interpreting and acting on these inputs will be a major ongoing challenge, as will integrating with supply chains and other existing data sources. To process and interpret these data streams, real-time visibility begins with analytics that can ingest data at ultra-high speeds, then create time-series models for interpretation. Time-series modeling, which charts data events over time, is simple in concept but not in operation because it requires, in addition to highly sophisticated modeling algorithms, an ability to create and access “big-data” contextual models. So in addition to raw processing speed, the analytics engine will need to be capable of scaling exponentially. The analytics will then compare results with baseline values, find commonalities, predict future states, and then turn that information into visual displays for use by non-technical managers. All this may seem too good to be true, at least in this early stage of digital business transformation. 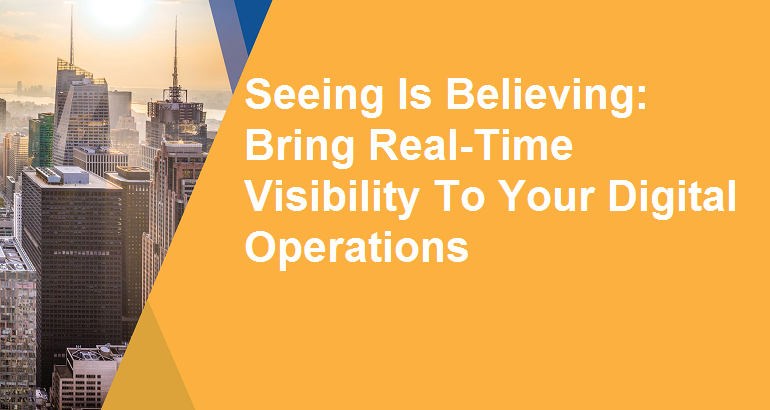 Real-time visibility is possible, however, and it’s in use today by many leading businesses. An example: catching a retailer’s supply chain problem before it snowballs into a more damaging breakdown. This retailer’s supply chain, using a combination of spreadsheets, emails and legacy tracking systems, is slow to detect a slippage in wholesale purchase-order delivery dates. The company’s supply-chain operations teams are trying to make up for the shortages by borrowing from other customers’ orders. As the shortages continue to grow, the company risks losing additional customers. Worse, once the problem rises to the executive level it will take more time to burrow through the operations’ growing complexity to find the root cause. By contrast, a visibility plane gives the operations manager real-time access to the raw material inventories, to the dates and quantities of inbound and outbound purchase orders. Management can now create regular reporting intervals for inventory tracking, and can catch similar problems as they occur, while they’re simpler to solve. Still, business is investing – must invest. The question for many is where best to start. The best answer, the answer with the best future, is in real-time operations visibility.